We rescued two 6-year-old Huskies in July, 2018. They were at a vet's office and were going to be euthanized. They are a male, Dakota, and a female, Nikita. Nikita has seizures. We already had a 1-year-old dog and a 5-year-old cat. We worked with a rescue group so if the Huskies did not work out with our cat the group would take them. They told me they had someone to adopt them. Last contact I had with them I was told “we cannot help you.” So here we are. Our cat is not safe around Dakota and Nikita. Around September our male dog and the male Husky, Dakota, got in a big fight and the tension that was already there got worse. Now the Huskies have to be kept separate from the cat and our dog. We have to play musical rooms in our house continually shuffling cats and dogs to different rooms so the Huskies can have some time out of their crates. I have cared for dogs all my life but never ran into this kind of aggression between the two males. Everything I have known to do is not working. I have researched it as well and tried new methods to no avail. I am a caregiver to my husband and dealing with this. I decided I need help. I searched a while looking for a qualified behaviorist to help us with our problem in hopes for some peace in our home. It was not easy but I finally found a behaviorist/vet from University of Florida who does not use fear tactics. She uses fear free behavior modification. She said she can help with the males fighting and the Huskies aggression towards our cat. However, it will cost us a minimum of $700 for her to come out and assess the situation. She will show me how to work with everyone to change their behavior. If we need more follow-up help it will cost more. We have recently had to say goodbye to many of our old rescued pets. The last one just two years ago. In the process we have gone deep in credit card debt on vet bills and emergency visits. We are on a fixed income and cannot afford more debt. However, Nikita had a seizure cluster shortly after Hurricane Michael and had to go to emergency. That and her follow up visits and blood tests put us a few hundred more in credit card debt. Continuing the way we have been has been more work and time than I can afford on my own. It is not fair to our cat or any of the dogs. It is also a dangerous situation. One mistake and one of the animals could be seriously hurt or worse. 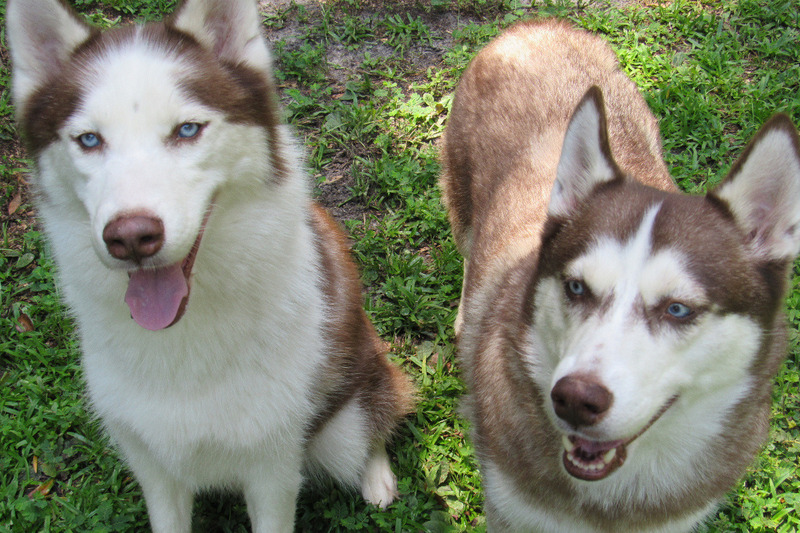 Dakota and Nikita are wonderful dogs. They don't have any training but are very sweet. They love each other and love to be together. The two males get along fine with Nikita. While this is not the ideal situation for us, more vet bills, credit card debt and older dogs so soon we are committed to keeping these dogs safe. I don't know that we could adopt them out together since they are older dogs and Nikita has seizures. So if we are to keep them we have to get this dangerous situation under control. We want to get our home back in a peaceful situation where everyone can live side by side with no danger. I hope to make my already heavy workload as a caregiver a little easier. Most of all it will help Dakota and Nikita live out their days in a safe loving home. We need to fix this soon before someone gets hurt. It will take a lot of work but we would be very grateful if you could help with the cost. Please donate what you can to help us keep these Huskies in their home and make it a safe home for everyone. If only 70 people donated $10 we would raise enough for the initial consult. It will really help our family find peace again and Dakota and Nikita and our dog and cat can live fear free in one big happy family. Thank you for reading our story and we greatly appreciate your help with a donation if you can and please share this with your friends. Thank you so much to those who have been generous enough to help Dakota and Nikita and donated. We only need 50 people to donate $10. The sooner we get help the sooner everyone will be safe and happy. Dakota and Nikita cannot spend their lives in crates. Any money donated beyond the $700 will go to more sessions with the behaviorist, if needed, or to their vet bills and Nikita's medication for her seizures. Thank to everyone who has shared this and to those who have donated. You are helping us get a little closer to a happy home for Dakota and Nikita and everyone involved.